This is the second version of this post. The first one was lost last night when I closed the tab instead of going back. I thought it was time to revisit the green beans and tomatoes with couscous recipe I first played with here when I got back from my brother's house the Christmas before last. 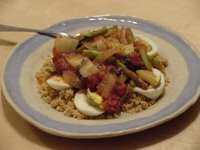 The vegetables worked well together, the seasonings were fresh and vibrant, and it went really well with whole wheat couscous. But the eggs were only so-so. They really only worked because I like hard boiled eggs, not because they added something specific to the overall effect. I made it one more time as a side dish, without the eggs. And again it was good, but nothing special. I put it on the back burner and always meant to work on it some more some time. Some time came last week when green beans were on sale and the mushrooms looked really good. I decided to make it again, but I wanted to find something to pair with it other than eggs. Beef and pork seemed too heavy, and chicken didn't seem like it would stand out enough. I don't cook much with fish, so it doesn't often come to my mind as a possibility for a dish I'm working on. But when I thought about adding tuna, I knew it would be perfect. Unfortunately, the fish did not look too good that night at the grocery store. I thought about buying some tuna in a bag, but I have all these cans of salmon on hand I bought when there was a run of "buy one get one free" on it a couple of years ago. Salmon seemed like it would be a reasonable substitute for the tuna. And it was. I suspect it would be even better with tuna. And I now have some flash-frozen ahi tuna from Trader Joe's sitting in the freezer for next time. It's a good thing I'm working on emptying out my freezer. A trip to Trader Joe's this weekend filled it right back up again. 1 16-oz. can salmon, boned. Heat oil in large skillet. Add onions and saute approximately 5 minutes, until translucent. Add green beans, salt and pepper and cook another 5 minutes. Add mushrooms and cook another 5 minutes. Add tomatoes and let simmer for 10-15 minutes. While mixture is simmering, prepare couscous according to package directions. Remove green bean and mushroom mixture from heat and stir in lemon, parsley and basil. Fluff up the couscous. 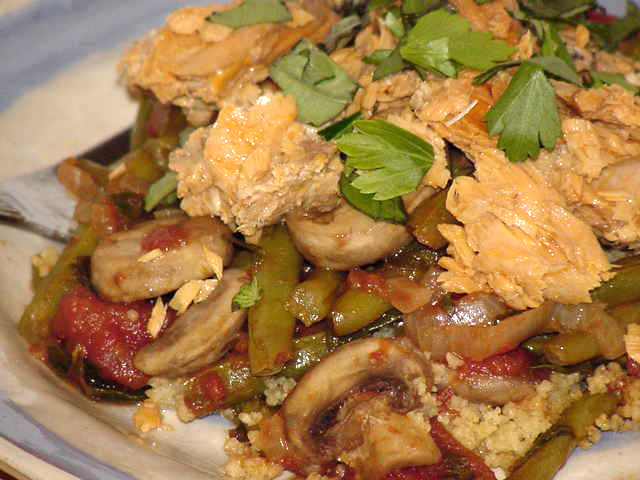 Serve vegetable mixture over couscous. Top with salmon and garnish with chopped parsley and basil.